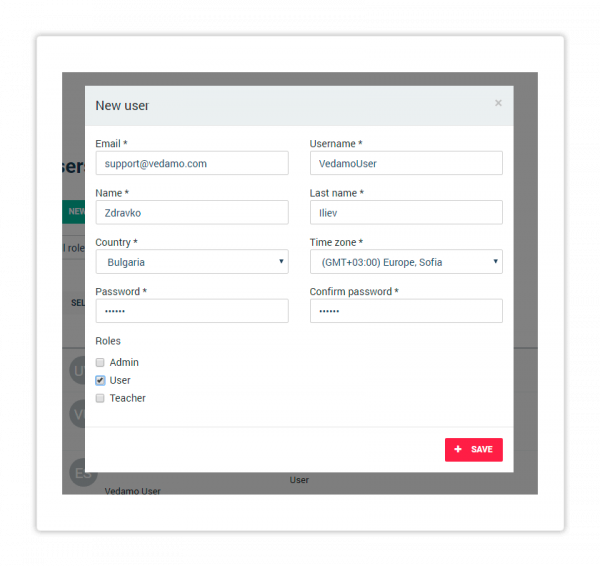 The LMS Users administration menu gives Administrators and the Organisation account access to the user administration panel for all accounts registered in your sub domain. To access the LMS Users administration menu, log into your sub domain using an Organisation account or an Administrator account. The Users menu is accessible through your left side menu. Admin: This role should be assigned only to people who will be administering the system. The administrator has full access to the user administration menu. Admins cannot be assigned as teachers in a course. 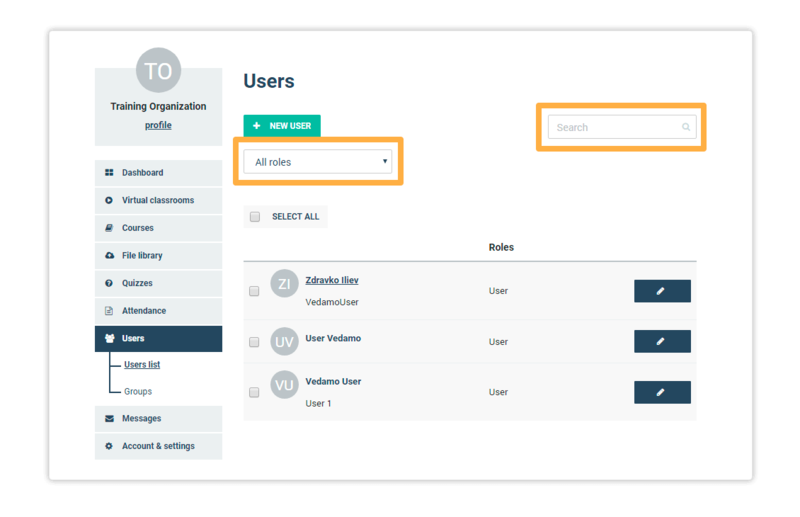 In an Learning Management System, admins have the option of opening a virtual classroom through the Virtual Classrooms menu. Once done, click the + Save button to save the account. NOTE: The number of accounts you can create in your sub domain depends on the subscription package that you purchased. If you try to create an account that goes over the limit, the system will alert you that you have reached the limit. 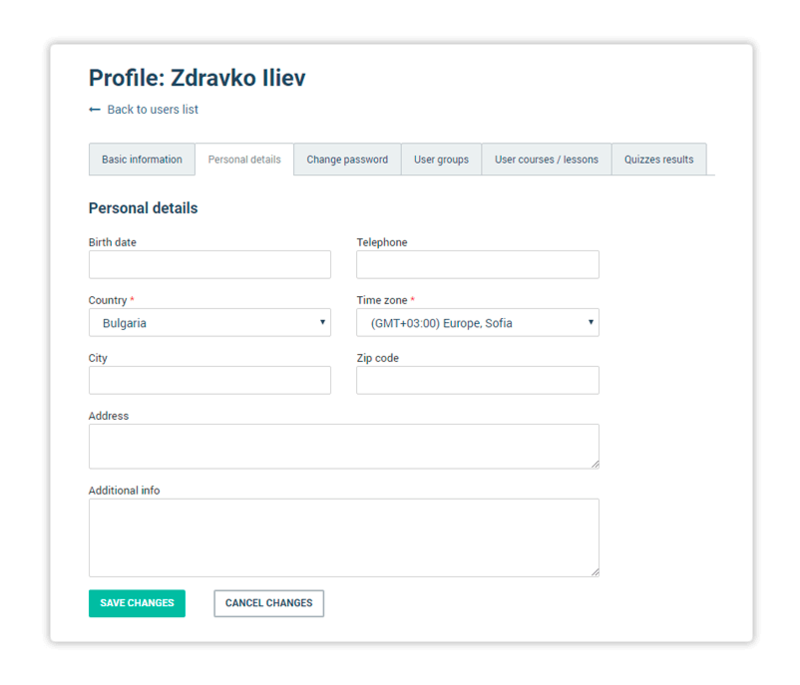 You can upgrade your LMS plan if you would like to increase the number of accounts you can create. In the user administration menu, you have sorting options and a search field that can help you locate the account you are looking to edit. 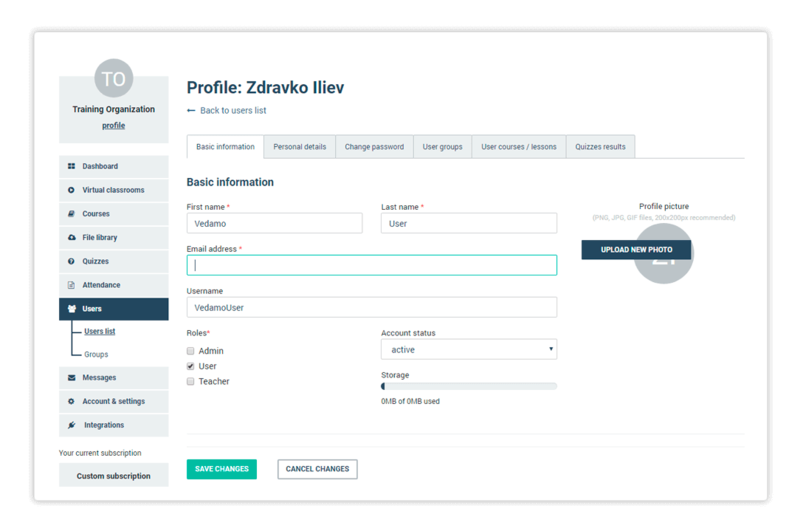 For example, you can sort all user accounts by role or type in a user’s name or email address in the search field in order to find their account quickly. You also have the Select All option to help you quickly select all of the accounts displayed on the page. Clicking on the pencil icon to the right of the account name will allow you to edit an account. Editing another user’s profile is very similar to editing your own. However, there are several additional options. Deleted: Choosing this option will completely delete the account. It will no longer appear in user lists and cannot be recovered. 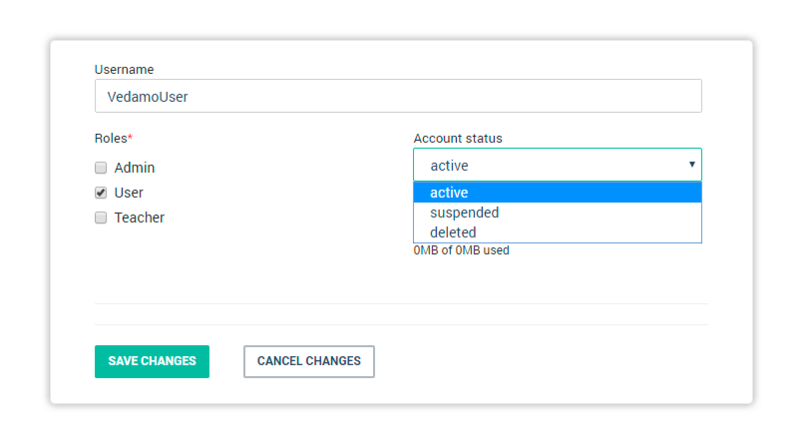 NOTE: Setting an account to suspended or deleted will reduce the count of active accounts in the system. This is useful if you have already reached the account limit afforded by your subscription. For example: Your subscription package affords you 50 active accounts. There are currently 49 accounts active in your sub domain and you need to add two new student accounts. You notice that one of the students currently registered has not participated in any courses for a year. Setting their account to suspended will let you create the two new accounts you need. NOTE: There are several additional fields available in tutor accounts, allowing you to add the tutor’s subject, courses, experience, education and certification. If you submit any changes here you will need to save them by pressing Save changes. Otherwise, they will not be saved if you navigate away from the account. This tab allows you to create a new password for the customer. This is identical to changing your own password except it does not require you to put in an old password. This tab shows you group membership for this account. Additionally, you can remove a student from a group by clicking the X button to the right or add them to a new group via the green Add user to group button. NOTE: You may have noticed that the Users option in the left side menu contains two user administration sub menus: Users and Groups; This article discusses the Users sub menu. The next article will look further into the Groups sub menu where you will learn how to create and manage user groups. This tab lists the course(s) this account is subscribed to.